Greene said there is not “an avenue” for Auburn to fix the schedule with Georgia and Alabama alternating home and away until the current SEC rotation ends at the end of the 2024 football season. Still, there is a possibility the SEC could move the Auburn-Georgia rivalry game to early in the season starting in 2020. The Tigers are currently scheduled to play UMass on a date usually set aside for the Deep South’s Oldest Rivalry in 2020. This situation occurred when UGA was required to play at Auburn in both 2012 and 2013. Didn't hear Auburn whining about that. What happens if UGA and Bama drop in quality? Then Awbun will want to trade to another situation. Biggest bunch of whiners in CFB. First they want to move to the East division to make for an easier schedule and now they want to move rivalry games to make for an easier schedule. This is because of the rediculous schedule Auburn had at the end of the season. Played 3 top 5 teams back to back to back. No one can withstand that. Gutless cowards. I mean, we know they are, but it's nice to see them go public with it. Says program from the east that only got into the playoff last year because of an embarrassingly soft schedule. I love what this potentially can do for LSU....move the UGA game up and the LSU game back then LSU can take their bye week before Auburn instead of Bama. I don't care if Bama wants to take it the week before LSU or not. WTF is going on here? What is the issue? 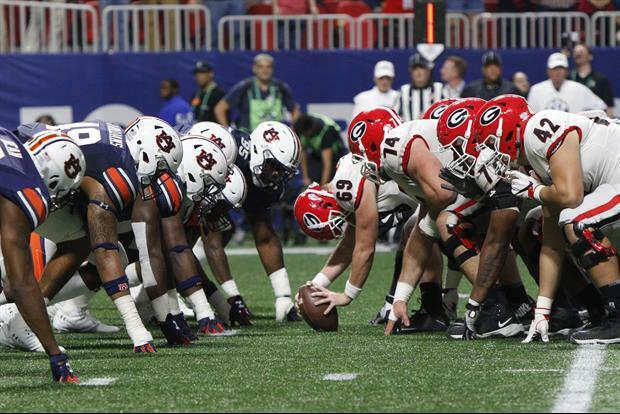 Auburn is having to play both UGA and Bama at home in odd years and both away in even years. They want that changed. This occurred in order for the SEC to schedule Bama and UGA. Take my word for it because you probably wouldn't even read the lengthy explanation. Suffice to say that scheduling is one of the most "easier said than done" things going. Change one thing and it is liable to effect a half dozen others. Move the Bama game earlier. The Auburn-Alabama game just isn't as important as a last-week game makes it appear to be. It's a Rivalry Week thing. They're not keeping the game there because it's important in the larger picture (though it frequently is) but because it's part of the theme the leagues and the networks promote. Bama plays Auburn. Georgia plays Tech. We play UT. OSU plays Michigan. USCe plays Clemson. And so on. Rivalry week. Maybe you've heard of it. I guess we should move wash-wash state, fsu-Florida, Oregon-Oregon state, Clemson- south Carolina They just aren't important games. IF ANY rivalry week game has had "national importance" it's the iron bowl. SMDH. The SEC is already moving the DSOR forward. Auburn is scheduled to play UMass in 2020 on the date they normally would play UGA. This is short-sighted. Right now, LSU and UGA alternate home and away on Auburn's schedule. Changing it will give auburn the same problem, just with LSU instead of UGA. Yeah, those Bama and UGA are on top of college football more consistently than LSU right now, but how long will that last? Early 2000s, LSU and UGA were at the top. It's cyclical. Lsu needs to move bama to the beginning of the season. 11 o clock kickoff, on Espn+. If Alabama played Auburn early in the season every year Auburn may not win that game ever again. This article doesn't clearly state what is being suggested. Larry was probably spanking it to Lindsey Vonn or Ronda Rousey when he wrote that. We all know who will have the final say on any scheduling decisions. Greene better send Little Nicky a fruit basket for the holidays! Lame, let's go back to the days of playing em back to back without the waste of time game in between. I do wish we could go back to having one home and away each year though. But that got ruined by two Big 12 schools. Ok, So the LSU vs Florida permanent matchup will be next on the agenda for review right? Stankey is a Florida fan, so no. "Really what we’re trying to do is find the solution for Auburn and the best solution for the league.” pppfffffffffffffffffffffffttttttttttttttttttttttttttt!!!!!!!!!!!!! !